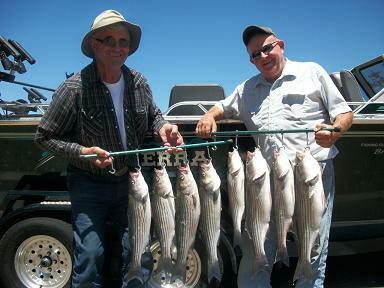 Late summer striper action proves to be excellent! The line sides are holding in the main lake 15 to 30 feet deep, and are falling for rolling shad, anchovies, and herring. We're still averaging 8 to 10 per day in the 4 to 6 lbs. class. Water temperatures 79 degrees. 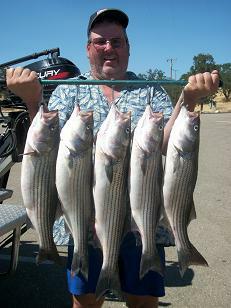 This week Don Theile of Danville had a great day on the water even though his partner didn't show up for the trip. 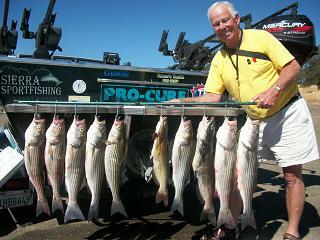 Don hooked up to 14 stripers, landed 8 and also caught 3 catfish with 1 weighing 5 1/2 lbs.